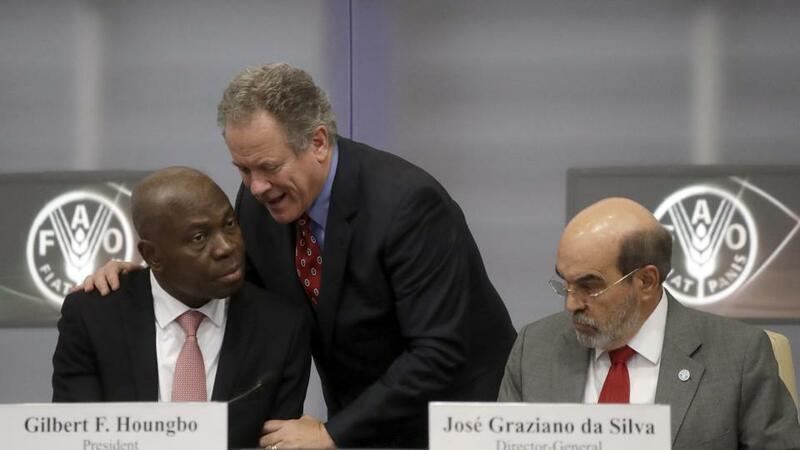 United Nations World Food Programme executive-director David Beasly, centre, shares a word with IFAD President Gilbert F. Houngbo, left, and director-general of the United Nations Food and Agriculture Organization (FAO) Jose' Graziano da Silva, at the FAO headquarters, in Rome on September 15, 2017. Global hunger levels have risen for the first time in more than a decade, now affecting 11% of the world’s population, as conflict, climate change and economic woes bite, UN agencies said on Friday. Last year, 815 million people were hungry --- 38 million more than in 2015 --- the five agencies said in the first global assessment since governments set an international target to eliminate hunger and malnutrition by 2030, as one of a set of so-called Sustainable Development Goals (SDGs). The number of hungry began to rise in 2014, but this is the first time in more then a decade that the proportion of the global population going hungry has risen. “We have a lot of research ... which says food insecurity doesn’t directly lead to conflict, but it is a very powerful trigger ... (and) food security has been as seen as a contributor to maintaining peace,” Milisic said. The proportion of children stunted by hunger fell to 22.9% in 2016, from 29.5% in 2005. Now, about 155 million children under five years old are affected. Stunting can undermine children’s physical and mental development. “We see there is a decline - we also know that decline is not as fast as we would like ... to meet the SDG targets,” said Victor Aguayo, UNICEF’s director for nutrition said. The number of stunted children - short for their age - fell by 40% between 1990 and 2015 and Aguayo said this decline should continue. Asia has the largest number of hungry people - 520 million - and sub-Saharan Africa has the highest proportion of hungry, affecting 20% of the population. Falling commodity prices - especially for oil - have made it harder for some countries to import food and to fund state subsidies which normally protect people from hunger, said Jose Rosero Moncayo of FAO’s statistics division. Overall, however, it’s not clear whether the rise in the number of hungry people is a sign of longer-term trend, he said.